B-Girl LaneSki started breakdancing in Seattle, Washington in 1983 and was one of the first women to enter the circles of the early 80s. She danced with the Seattle Circuit Breakers who were one of the top crews in the city. LaneSki, now 38, still dances and attends Hip Hop events here in Hawaii and on the mainland to promote the true message of Hip Hop culture and perpetuate the art of breakdancing or b-boying. My class will focus on foundation B-Boying and basic Hip Hop movement. Each day will start will a short lesson in Hip Hop history and then we will warm up with some basic Hip Hop movement and rythmn excersizes before learning basic uprocking, footwork, foundation power moves, freezes. popping and locking. Each student will move at their own speed and go at their own pace. My goal will be to teach students the basic steps and let them put their own expression, talents and skills into the dance while having the background to understand its true purpose. .just ask for B-Girl Yoda. 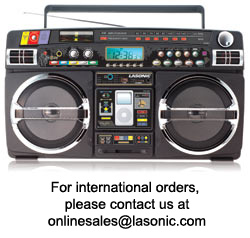 Mahalo to Lasonic for sponsoring us this killer I-Pod Boombox for our summer and fall classes! The kids loved it and so did I. There are a lot of really lame Ipod boom boxes out there that are boring and expensive. Go to Lasonic.com to check it out. Cost: First Class Free. Semester pro-rated to end of semester which goes thru Dec. 10th with a show on the 13th.